In this universe, there are so many things which we can’t see such as air, temperature, light etc. but we feel their presence because of our senses. Like these things some diseases of society such as egotism, jealousy, pride, anger, negative love, negative emotions, negative curiosity etc, are also invisible but can be detected through the same senses. Pride is as ancient as the age of Satan. This disease can attack within the four walls because it springs from human heart. During this disease man comes out from the codes of life and reaches at his “destination” without any hindrance (pride hath a fall). In literature many examples can be found. Now, I come towards other disease which is anger. Often we can not overcome over anger and always take wrong steps and let fall ourselves into gutter. Othello’s love for Desdemona is negative and she also falls in love after listening emotional stories. There is not emotional balance between Othello and Desdemona. Now, we can say the germs of negative love dragged characters towards death. In our own society, many characters commit suicide due to negative love and the result is not different from Othello. Negative emotions are like such a poison which decays a character slowly towards “destination.” Victim of this poison is always paralyzed and suffers himself forever. Cases of negative emotions are not less than negative love. Many people due to unbalance emotions paralysed themselves and their “loved ones.” In literature, Oedipus Rex, is the best example of negative emotions who makes himself blind. Negative curiosity is not less harmful than any other invisible disease. Oedipus Rex is more curious about the death of his father and the result is visible. It means the result of these diseases is visible and visibility is treatment. If we are not able to treat, we are full of errors and these diseases are not only our part but we are also the part of these diseases. 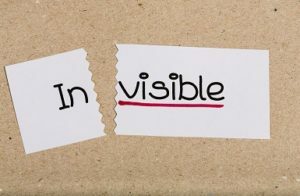 Invisible diseases give birth to visible diseases such as nepotism, favoritism, jobbery, corruption and so many others in different “attractive” dresses in modern age. Everyone of us has become known to all these diseases but we are not able to eradicate them. Why? Because we only discuss and not try to crush them with iron hands (politicians,) or power of pen and pleading (writers) due to our own involvement. It depends upon us to stop our involvement and is the only cure for these disease. All these diseases are attractive, therefore, everyone jumps towards them and falls into the pit of litter and trash. The roots of all these diseases spring from unfathomable ocean of desires. It is also interesting that the sources of invisible diseases are visible while the sources of visible diseases are invisible. All these diseases can be controlled and right decision can be made by keeping the balance between consciousness and unconsciousness because subjective and objective are sine qua non.